By Cameron Gillon: Sergio Martinez had tests with his doctors last month to show whether his severe long-term knee injuries can handle boxing if he decides to carry on with the sport he has dominated for so long. Martinez last fight was in June 2014 when he defended his WBC, Ring and Lineal titles against Miguel Cotto at Madison Square Garden, New York. Cotto came out sharp and Martinez wasn’t looking his self in the ring as Cotto put Martinez down three times in the first round and the fight looked like it wasn’t going to last more than a few more rounds. Martinez managed to recover and take the fight into the championship rounds before Martinez trainer decided he wasn’t going to win the fight and had nothing left to go for the knock-out on Cotto. 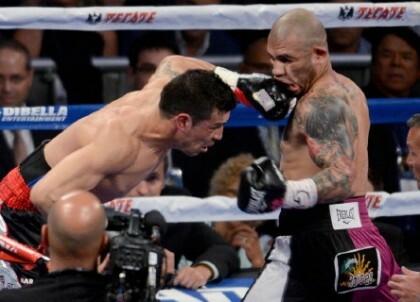 Cotto won the title’s and left many boxing fans and others wondering whether we have seen the last of Sergio Martinez. Martinez has shown his recent wish to carry on fighting but is relying on doctors to tell him whether his injuries that he has suffered with for a few years have healed enough and are stable enough for him to continue. I’m sure Martinez doesn’t want to retire on the back of the Cotto fight as any fighter wants to redeem themselves if they have the opportunity. Martinez had a 50 month reign as the middleweight champion, he won the WBC middleweight title when he ended Julio Cesar Chavez Jr’s unbeaten career run by beating him on a 12 round unanimous decision, Martinez was put down in the 12th round by Chavez and this is where many believe he suffered the horrific knee injury that has haunted him since. Martinez then defended his titles against Britain’s Martin Murray and he had a big 14 month lay off before fighting Miguel Cotto due to having surgery on other injuries, not just the knee ones. Martinez is regarded as one of the most avoided fighters when he was in his prime, he is a former world champion at light middleweight and middleweight and famously knocked Paul Williams out in their rematch after Williams beat Martinez on a decision in their first fight. He was ranked a career high number three in the pound for pound and other notable wins are against Kelly Pavlik, Darren Barker and Sergiy Dzinziruk. Martinez hasn’t been vocal about whether he has had his results back or whether he has and is still deciding on his next move, Martinez says he wants to try to regain his world title’s from Cotto but that is highly unlikely as Cotto is looking for bigger fights against Floyd Mayweather Jr and Canelo Alvarez in 2015. Martinez best bet is to have a few fights against lower tier opposition to see how he is in the ring and if he gets through them fights well and looks good then look to win another title, but if he does retire, he has been one of the best fighters of this generation for sure.